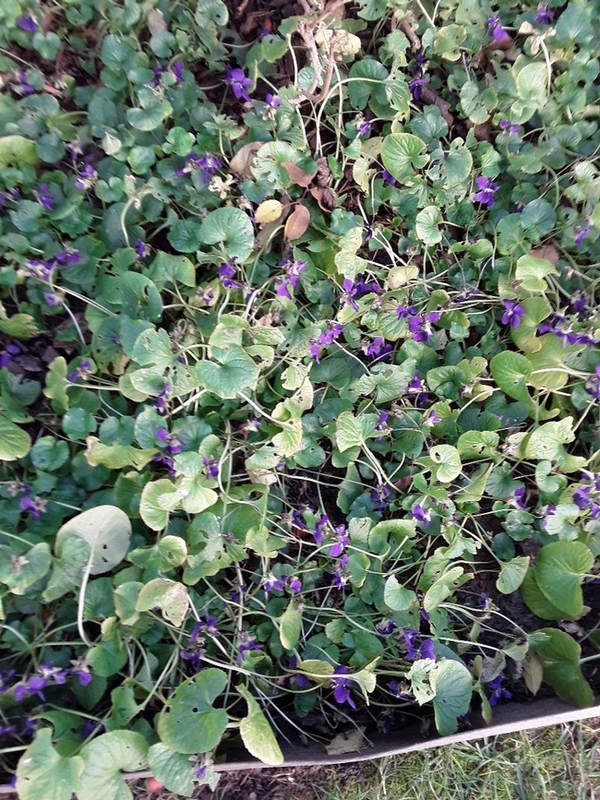 While trying to decide what to write this blog on, I glanced out my family room window and saw some of my violets still blooming, not as many as during December through January. The leaves that were few and far between in late October are growing as most of the violets die back. Some of you might know these plants by its many common names, the botanical name is Viola odorata, Some of its common names are, garden, sweet, wood violet and of course common. Several years ago, I brought home a very small container of violets from my parents home to remember their Vacaville garden. It was the “plants to grow" back then. Almost every garden had them. So this small container came with me to Fairfield. I didn't know much about gardening then, ( I am still learning, new things every day )but I soon learned it didn't take them long to move from the small container to a small patch of soil. Now they are all over, growing in cracks in the cement and clear across the yard from where they started from. YES, they are invasive, once they move in, they do not leave no matter how you try. You think you have removed all of them, then turn around guess what, they are back. But there is a good side to them. In the winter, most of the leaves die back and the purple violets bloom. So they do add some color on a cold winter day. In the summer, they might have a few stray violets but not many, they mostly leaves then. Oh yes, I took some back to the garden they came from, so now my granddaughter and her husband can enjoy plants from her great-grandparents yard.